"My fancy for old brick structures never ceases, even when they are in cemeteries"
There was the three of us artists (Me, Cesar D. and Rene N.) who went for a road trip to various destinations in the province of La Union as part of the activity of the informal group "Ag Sketch Tayo" and we planned to sketch the old chapel inside the cemetery of Luna, La Union as one of our subject for its historical value. We entered the cemetery and the old facade of the Ermita church can already be seen from the distance as it loomed from the central portion of the cemetery. I said, "bari-bari" (our usual way to ward off the unseen as not to bump or step on them) as we walked along the obvious pathway between tombs. We passed through an old deteriorating brick entrance arch that eventually led to the ruins of the old Ermita Church minus the roof. Continuously taking video as I went inside while my two companion just stayed outside. The inside was creepier than I thought, the sad cement-gray altar had small arches and deep within those arches were darkness that my mind played with imagining what were lurking inside those shadowy darkness. At the side walls near the entrance, I saw some "lapida" or wall-mounted gravestones and wild plant had grown covering most of the place (not yet cleared for the coming All-saints and All-souls day this coming November 2015) while a bird keep on chirping inside. We did not lingered there and decided to leave the place and do our outdoor sketching somewhere else. This was my first time to see the Nuestra Señora de la Asuncion or Sta. Maria church which is declared as "UNESCO World Heritage Site". At the eastern side of the church was a flight of stairs going down that led to a pathway. It looked inviting, I was thinking of maybe it leads to some church garden or a park. I fell for it so I went down the stairs and walked along the pathway. It led to an old brick entrance arch probably as old as the church and inside was a cemetery. What caught my attention was the old structure further inside. It was an old chapel with nice architectural details inside but with no roof. I took some photograph of it. What was funny was I sometimes look at the preview on the camera if I caught something unusual. The stillness of looking at those old style architectural details felt eerie. I went back outside the old chapel and further outside the entrance arch then went to see a cross up on a hill just nearby. 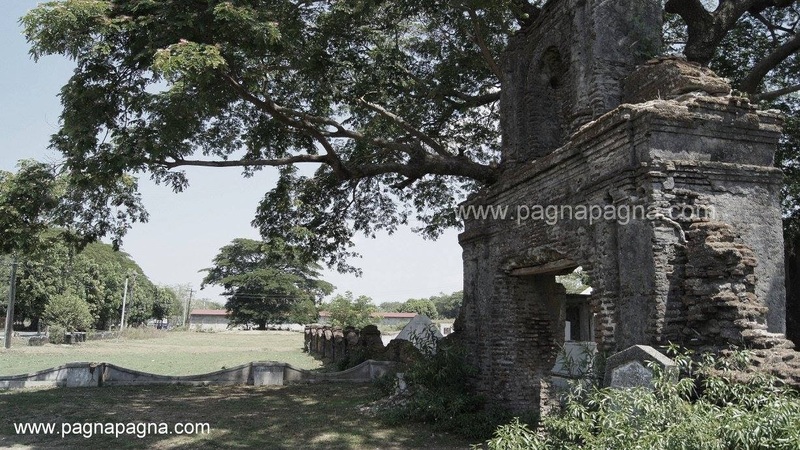 On my Ilocos Norte church escapades, I went one day to Dingras, Ilocos Norte and on my way, riding a passenger jeep from Laoag City, I saw an old brick structure by the roadside of Doña Josefa Llanes Escoda National Highway. After seeing the Dingras Church, I went back to see the old structure by the roadside. It was an entrance arch of a cemetery. Made up of bricks and slightly being eaten away by time. I just had few minutes at the place and hit the road back again.